Chef David Thomas grew up watching his grandmother prepare culinary masterpieces from scratch. In her small kitchen on 13 acres of land, he learned at an early age that quality ingredients are the foundation of great food. In 1992, David, along with his wife Tonya, started a small and successful catering company. In 2000 in his pursuit to elevate his skills, he then went to work for Master Chef Kevin Zabonick. He learned every aspect of the brigade system one station at a time. After 2 years he was given a recommendation from the master chef to be a sous chef for the Aramark Corporation, and was hired as head chef to run his own unit. After years of corporate dining and unsatisfied with the corporate way of preparing frozen prepackaged foods, he left to work for a prestigious Maryland golf club. There, David ran a fine dining 90 seat restaurant, 250 seat ballroom, with 3 satellite locations. Still, he was not able to pass up an opportunity to evolve and grow. He then went to work for the award-winning Chefs Expressions, owned by the renowned CEC/sommelier Jerry Edwards. Here he found himself working more with local ingredients and ingredients than ever before. Desiring to be back in restaurants, he went on to work in several area establishments over the years. Most notably, he was hired as the executive chef to open the farm-to-table Metropolitan Kitchen/Lounge in Annapolis, Maryland. Here he found his true culinary vision and developed his signature cuisine: modern soul food. Seamlessly blending cuisines such as Latin, Asian, French, Caribbean, and more into American Southern low country dishes, his dishes finally became a true expression of self. David was hired to be a chef consultant for a company where he was able to travel throughout the country. This gave him the opportunity to learn more about local regional cuisines. David gained an understanding that Southern food is fusion of cultures. This would be the beginning of him wanting to incorporate more indigenous and heirloom foods from Maryland and the South. 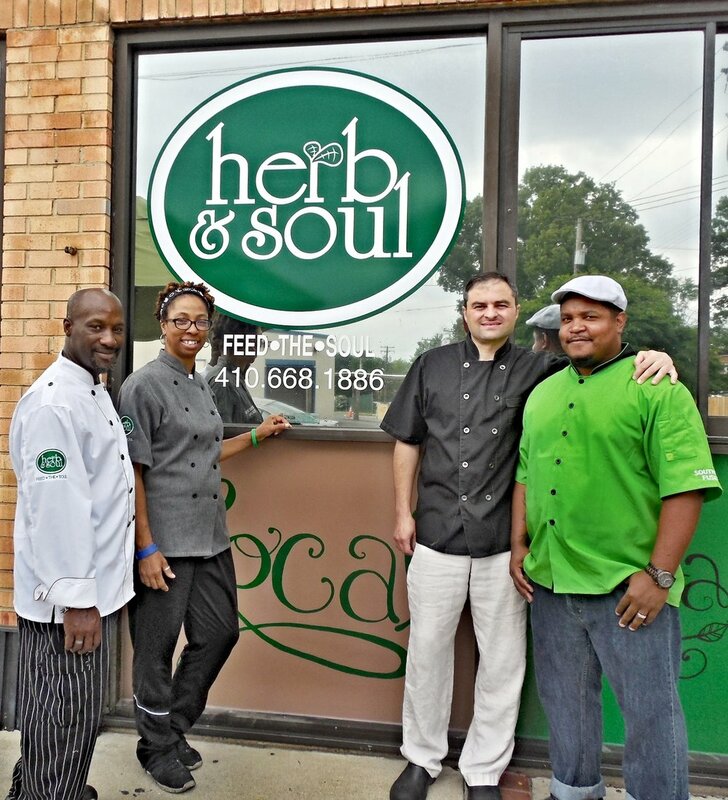 In 2012, David along with his business partner, opened Herb & Soul: a farm to table, local and sustainable carry-out. Within six months they had built such customer demand and a following, that they transformed the carry-out into Herb & Soul Gastro Café /Lounge. In a short period of time, it became a 4.5 star restaurant on multiple platforms. Herb & Soul won numerous awards, and David went on to be featured on "Tasty Travels," as well as several local television stations. He also was highlighted in publications such as Style Magazine, The Baltimore Sun, Foodservice Monthly, Black Enterprise, and Cuisine Noir. David loves sharing his passion for cooking with youth through the Days of Taste program. This program helps to educate 3rd-5th graders on where their food comes from, along with helping them learn healthy eating habits. David is working on developing a high school culinary program for developing future local and sustainable chefs. Chef David Thomas is currently Executive Chef and owner of Ida B’s Table in downtown Baltimore. Ida B’s Table, under the direction of Chef Thomas and his wife Tonya, focuses on modern soul food. He focuses on sustainably and/or locally sourced products. In addition to Ida B’s Table, Chef continues his work with Days of Taste in educating 3rd-5th graders on where their food comes from, how to create a recipe from scratch, and how a chef processes and combines flavors to create something delicious. David K. Thomas recently won the title of Chopped Champion on Food Network’s show Chopped in their Thanksgiving Day Special (Thanksgiving Pie, Oh My! Season 42: Episode 2) and continues doing regular educational programming with local organizations and publications. Stay tuned for more exciting things COMING SOON!!! !